Naina Lal Kidwai is Executive Director on the Board of Hongkong and Shanghai Banking Corporation Limited and Country Head of HSBC India. An MBA from Harvard Business School, she has been recognised in India and abroad with several awards and listings for leadership and business. Repeatedly ranked in the Fortune global list of Top Women in Business, in the Wall Street Journal and Financial Times Global Listing of Women to Watch and listed by Time Magazine as one of their 15 Global Influentials 2002. She received the Padma Shri from the Government of India for her contribution to Trade and Industry in 2007. She is a member of many govt bodies, e.g. Member Prime Ministers Trade and Industry Council, Member National Manufacturing Council, Member National Trade Council, Member Government – Industry Task Force, Member of BRICS Business Council. 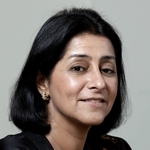 She is Executive director on the board of HSBC Asia Pacific and Chairman/board member of HSBC entities in India, Non-executive Director on the Board of Nestle SA and member of the Audit Committee, Global Advisor Harvard Business School and Chairman India Advisory Board, Advisory Council, United Nations Environment Program (UNEP). She is also former President of the FICCI India’s leading Industry Association, and a member of the Board of Shakti Sustainable Energy Foundation and TERI Advisory Board.